UPDATE: Now T-Mobile has issued an updated statement on the Galaxy Note 7, urging all owners to power down their devices and return them to T-Mobile. One day after T-Mobile announced that it was halting sales of the Galaxy Note 7, Samsung has said that it’s urging all other carriers and retailers to do the same. Samsung says that it is asking all of its carrier and retailer partners around the globe to stop sales and exchanges of the Galaxy Note 7. The company is now working with regulatory bodies to investigate the recent reports of replacement Note 7s catching fire. If you’ve already got a Galaxy Note 7, Samsung says that you should stop using it and power it down. As a reminder, if you’ve got a Galaxy Note 7, you can take it to a T-Mobile store and get a full refund and choose from any other device in T-Mo’s inventory. Your restocking charges will be waived, and you’ll be able to keep any pre-order gifts that you may have gotten. Finally, T-Mobile says that anyone that returns a recalled Note 7 (purchased on or before September 2) will receive a $25 bill credit. This is the biggest (or at least highest-profile) product disaster in smartphone history, no? Maybe just in product history in general. nah. ford pintos. people died, there. the subaru gas mileage debacle had a pretty high value. Pinto had multiple recalls and could start a fire while off? Source? google ford pinto deaths. it was actually a groundbreaking event because it exposed how ford calculated the cost of lawsuits from deaths vs. the cost of a better fuel tank. But it didn’t blow up when it was sitting in the garage right? The Note 7 is the first consumer device I am aware of that can kill when stored and off, and worse, had a “fixed” version re-released to the public that wasn’t “fixed” at all. no. you said the biggest consumer product disaster. And I still think it might be. The Note 7 is the first consumer device I am aware of that can kill when stored and off, and worse, had a “fixed” version re-released to the public that wasn’t “fixed” at all. within those narrow parameters, probably. Any product with a lithium ion battery can burst into flames, even when powered off. The battery doesn’t stop discharging just because the device is off, it just isn’t as rapid as when it’s on. This appears to be due to a contaminated cell. It’s most likely shorting out and going into thermal runaway. While it is not as likely to happen when the battery isn’t stressed, it still can happen. I doubt it is the battery since the replaced galaxy 7 note phones have a battery made by a different manufacturer and still has the same problem. Except years later the truth came out about the Pinto – it was no less safe in a rear end crash than other small cars of the era. The media needed a story and the Pinto, like the Corvair or the GM Side Saddle Gas Tanks was more fallacy than truth. “The truth about the Pinto was only much later revealed by a 1991 study in Rutgers Law Review by Gary Schwartz. You can google and read the whole report. And this types of “cost of deaths” calculations happen all the time in business. On or before September 2nd? They did t go back on sale until the 5th, and that’s the day I purchased. I should qualify as well since I am supposed to return it now…wtf.man. They gave me a $20 bill credit. I bitched so hard about that and they gave me an additional $50 bill credit. I’m having so many problems with all these returns (see my post above) That I may dump T-mobile. No, I love my note 7 man. I loved my Note7 as well, but I love my un-burned-down house and car more. If recent reports are to be believed, powering them down doesn’t stop them from bursting into flames. take the battery out, then. oooppssss…..
Is Samsung reputation ruined? This is unbelievable! I think they’re past worrying about that and on to worrying about liability. It will be a while before I pre order a sanding phone again. This is a disaster. Pre-order phone, receive phone, turn in phone because it could go boom, get new “safe phone” with green battery bar, now urged to turn off phone and trade it in because it can still go boom. Only good thing is I have gotten 2 256 GB RAM cards and a VR from this mess. Guess I am getting a 3rd when I get the s7e back again. Which I did not love. I got a gear fit, a 256GB and I’m waiting for the gear VR to get shipped (if it even ships) I didn’t like the s7 edge at all, the edges are more pronounced and they are really sensible. I regret jumping from my nexus 6, I love the note 7 but for now I’m going to turn it in and pull the nexus 5 from the drawer lol and see what comes next. I’m neither going to confirm or deny that i did the same thing but the VR will not work the Note 7’s now. I had to use my wife’s S7 to use it last night since they killed the support for it. I’m like you too I did not like the S7 edge. I like the Grace UX, bigger screen, more internal memory (even though the memory card helped), Better edges. I do not know what to get. Maybe the V20 but they wont be out for another 2 weeks i think. Not to mention they only phones I have owned since the HTC glory days was, Note 2, 4, and 7. On the plus side, Samsung is FINALLY getting more press than Apple. So there’s that. Maybe they will bring back removable batteries. I told you months ago this device was junk. -yawn- If you did, I’m sure it was a non-specific, trolling comment like the one you just made. my replacement note 7 is fine its even charging with no heat. i love my note 7 will not return it. Yes you will. You just don’t know it yet. Are you serious? Samsung will no longer support this device and Oculus just sent out an update that will kill the gear vr feature on all Note 7’s. Don’t be surprised if the try to forcibly shut down the phone via a software update. Get rid of it and get a different phone, be considerate of the people around you and do not put others at risk. 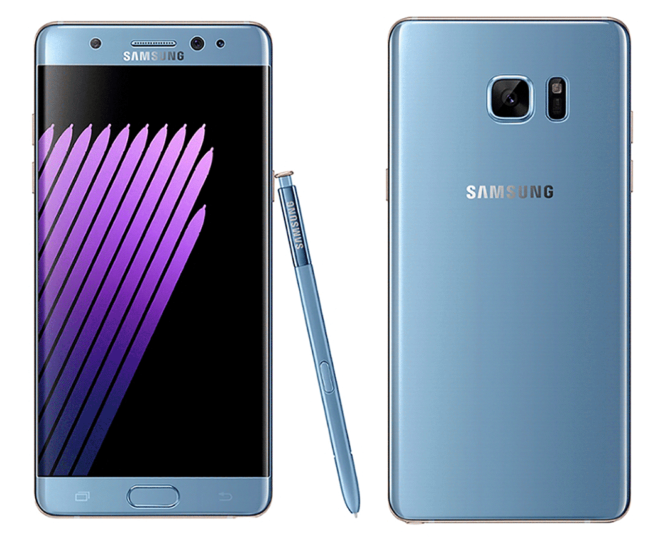 So the Note 7 is officially a collectors item? If it get’s another official recall, I don’t see how they could salvage it. If that’s the case, anyone that chooses to keep it better think about the lack of support/updates. Since there would be no reason for Samsung to continue support and updates for a phone that had been recalled. Samsung is sure having a bad go of it. This will probably influence sales of future note versions. NOTE probably bit the dust over these recalls. Yes, did you see their exploding washing machines? I was watching NBR and the guest said some hard changes needed to be made, but not at the board-level: I feel some people need to resign from the board since Samsung has had a reputation for lowering internal quality the last few years (such as total obliviousness to security problems) that has now finally come to a head with spontaneously-combusting phones and and exploding washers. How about going back to a removable battery ? Or put in a bigger battery maybe… waiting for noh1 to respond….. waiting.. Most devices these days are designed for certain sized batteries made just right for a device. So having the pointless removable battery feature would just mean replacing a defective battery from the manufacturer for another defective battery from the same manufacturer and same factory.. They just need to flip the kill switch. Give owners a message that their device will quit working in 7 days to give them time to migrate and switch, then prevent it from loading a launcher after that time. There’s a group of people hell-bent on keeping them and IMO, that’s just hazardous. What if those “perfectly fine” devices catch fire in a students pocket while in a classroom. Or while it’s charging on the nightstand while you’re showering. Flip the kill switch, make it mandatory–not a request. Samsung needs to start working with their S-Pen patents and start looking at licensing agreements. This is most likely the death of the Note line. They also need to push an OTA to all Note 7’s with the description saying the device is defective and should be turned off and returned where it was purchased. If the customer does go ahead an install the OTA, a message will pop up when the phone reboots that says the same disclaimer on every reboot and changes the boot logo to say something to the extent of “Defective device, please power off and return. May catch fire,” followed by an announcement that all affected SKUs will receive no further updates from Samsung. This is really going to leave Samsung with a black eye and the more irresponsible people who decide that keeping a device that can catch fire there are, the more likely someone loses their house, or worse, their life, with one of these ticking bombs. Before anyone throws numbers at me, keep in mind these are new batteries. The more a battery ages, the more likely it is to fail and catch fire. These are happening in devices not even two weeks old. That number will definitely go up as the batteries age and the affected cells get stressed, especially if it’s a contamination in the battery itself that’s causing the problem. Do the responsible thing and return the device. No cell phone is worth the risk! I heard on the news tonight that the replacement batteries are from a different manufacturer: if true, then the problem is the charging circuit. I find it hard to believe this is the end of the Note line: one borked device does not kill an entire product, otherwise Touchwiz would have killed the Note a long time ago. I continue to find it VERY interesting that this problem affects ONLY the Note-7 and NOT the S7. What exactly did they change in the charging circuits or battery manufacturing? I find it very hard to believe that they are from a different manufacturer. Samsung had no way of expediting a custom order (these are custom fit LiPo cells after all) unless they knowingly sent out defective batteries to hit their launch target. If the devices are still catching fire when the power is off as has been suggested, it’s the chemistry of the battery itself that is at fault. The same thing is suggested when the device catches fire and is powered on but not charging as well. It’s unstable chemistry in the battery cell itself that causes the reaction leading to thermal runaway and fire. Good thing these aren’t the plastic toys Samsung used to make or it would be even worse! It’s getting old having to go through all this. My wife has the iPhone 6 plus and it is always heating up, all of her iphones always have. Its official. Samsung has permanently pulled the Note 7. Their shares dropped 17bn in value already. Yeah basically Samsung confirmed they will no longer make the Note 7 and it seems the Note series is dead. The Note 7 is dead. I haven’t heard anything from Samsung announcing they will kill the Note line. It will most likely be released under a different name since the same naming scheme won’t work anymore. The “Note” brand which is part of the phone may have actually ended for good. Stop starting BS rumors the Note 7 production has been halted. Samsung didnt say s**t about the Note Series being scraped idiot. Samsung is forever toxic period because of how they handled this. It would have been one thing if they actually FIXED the problem but two recalls and ultimately killing a product because they screwed up not once but twice shows massive incompetence. Who is the idiot now ? You made OP’s point. They’ve ended the Note 7, not the Note series. Call me what you want but I have every right to speculate based on legitimate concerns that the Note name may not be used again. I originally said that it will be rebranded as something else since they can no longer follow the current naming scheme because people will be reminded of the Note 7. No need to be emotionally invested in a muti-billion dollar company. Yeah, soooo, I don’t see where they are killing the Note line, just the Note 7. Do you really think Samsung knows at this point if they will call the next one the Note 8 or not? That’s what I’m thinking, it isn’t completely unthinkable that they’ll rebrand it to lose the stigma, but the Note line has been so successful it isn’t exactly like they have to do that. I’d buy a Note8 in a heartbeat. I honestly think the problem with the battery was Samsung reaching the end of being able to pack any more density into lithium based batteries. The S7/S7 Edge was it, and, if they’re smart, they’ll dial it back to that point and trudge on. I would also buy the Note 8 as soon as it comes out. If they said I could fix the Note 7 I would keep mine. i didn’t say the note line was dead. I did read it. I said I didn’t see that Samsung said they are killing the Note line. Obviously you are jumping to conclusions. and once again, i didn’t say the note line was dead. I guess I just didn’t understand what you meant when you said they will kill the note line. My bad, have a nice day. I’m still trying to get T-Mobile to fix my bill from the first recall. Even though I have all the paperwork, they claim my loaner phone is not in their system so I have been billed the full amount for that one. On top of that they charged me full price for the replacement Note 7 instead of it being financed. What a shame. It really is/was a nice device. Where does this leave T-Mobile? They hedge all their bets on Crapple and Sammy. Their phone lineup is weak. Thankfully, we have other great options, like the Moto Z Play, Oneplus 3, and Axon 7. I just wish T-Mobile would let B12 phones work on VoLTE for ALL devices that support B12. That’s true, but none of these are through the carrier. It would cool if LG or Sony would step up their game. Had a Sony Z3. Good phone. But I’d need to see more of a commitment from them to the US market to consider another Sony. Yea, LG shot itself in the foot with big price tag on the V20. I can see LG and maybe even HTC get some market share with this. I think another big winner will be Huawei. If only HTC started advertising their devices. As a result of this fallout, I can see the S8 being rushed to the shelves (ie: late Feb/early March.) and when the next series of Note come around (it will probably be rebranded as Galaxy S8 Plus, or Pro), they will offer heavy incentives to purchase to regain customer loyalty, such as BOGOs and other freebies. Which is really at fault, the battery or the phone? So what about JOD customers? Refund for money paid into the device? !